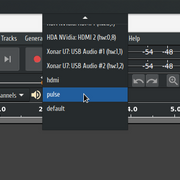 Doesn't have pulse output in Audacity with alsa-lib 1.1.7. With alsa output I have maximum loudness with impossibility to to control volume. Reverted back to alsa-lib 1.1.6 an solved issue. Found that problem begining from http://git.alsa-project.org/?p=alsa-lib … 5288d3cf9f commit. Reverting it with alsa-lib 1.1.7 also solved the issue. Just maybe anybody confirm this issue. Yeah, I also noticed audacity stopped working with pulse. Thanks for sharing, sc44. That patch fixes things for me. I've noticed that issue depends to applications using portaudio library as audio backend.